When I posted My Goalondo Chicken, I mentioned few times to make sure the freshness of spices. My mother reminds me to make sure freshness of chicken. Specially when we are talking about Bangladeshi cuisine “freshness is the main key ingredient”. Few things I love to share, in this recipe coriander seeds has a vital role. 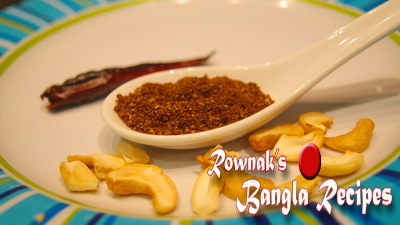 In Bangladesh all professional chefs /cooks and all authentic cook use roasted and peeled coriander seeds’ paste. First they dry roast coriander seeds; rub it with stone to peel its skin, and then take peeled coriander, even you can buy peeled coriander seeds in shop. If possible please use peeled coriander seeds. You can use Mustard oil to make it authentic but use of garam masala(in Bd cardamom and cinnamon is called garam masala ) over power mustard oil smell, so vegetables oil will give kind of same taste. Enjoy. 1. In a wok dry roast coriander seeds and dry chillies till they are fragrant, though I love to roast it separately to make sure both ingredients roast well. Stir constantly to prevent the burn. Grinder it into powder. 2. Make cashew nuts powder too. 3. Cut chicken into 12 pieces, clean and wash chicken; pat dry it. 4. Marinate chicken with all ingredients except cashew for at least ½ hour. 5. Heat the pan and add marinated chicken. Cook it 5 minutes and stir occasionally. 6. Cook it 10 minutes under closed lid and add 1 and ½ warm water and cook it till chicken becomes cooked and the gravy thickens. Check salt. 8. 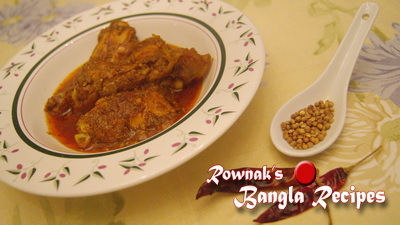 Serve Chittagong Chicken hot with rice or roti. In marination slice onion and onion paste will go together. I mentioned all ingredients except cashew nuts. Hope it will help. Thanks. Dear ms.rownak, i tried this recipe. it turned out very very delicious. my husband liked it like anything. 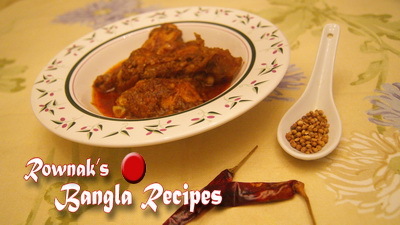 thanks for posting these bangladeshi dishes. you are a great chef. Today I cook this chicken,thank you for such a delicious recipe.it was so good thangs again. Most welcome. Good to that you liked it. No, dont need any ginger. Thanks.